This review first ran in the April 22nd edition of The Hamilton Spectator. There’s good news if you’re setting up shop or looking to change the world. It’s never been easier or cheaper to get the word out on your own. Now the bad news. It’s never been harder to cut through the clutter and get the rest of us to pay attention and help spread the word. “Facebook and Twitter are technologies, not strategies,” says Jonah Berger. 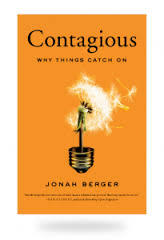 a marketing professor at the University of Pennsylvania and author of Contagious: Why Things Catch On. Drawing on a decade worth of research, Berger’s come up with six principles for social transmission. If you want to get lots of people talking and your cash registers ringing, do one or more of the following. Follow these principles and you stand a good shot at generating a ton of online and offline word-of-mouth buzz for even regular, everyday products and ideas. Blendtec blenders are a case in point. Tom Dickson founded his blender company in 1999. The product was great but awareness was low and sales were slow. Seven years later, Dickson hired a marketing director to help get the word out. The director was walking through the Blendtech factory when he noticed a pile of sawdust. And that’s when he learned about Dickson’s daily routine of trying to break his blenders. Dickson would put his blenders to the test by cramming two-by-two boards through the blades. So the marketing director spent $50 on a bag of marbles, a sleeve of golf balls, a rake and a white lab coat for his boss. The carnage was videotaped and posted online. Within a week, the low-budget videos had been watched six million times. Within a year, retail sales were up 700 per cent. Today, the Will it Blend? videos starring Dickson blending everything from a Justin Bieber CD and a can of EZ Cheese to an iPhone and his grandkids’ Transformer toys have been watched more than 300 million times. We’re surprised, amazed and amused when a kitchen blender pulverizes golf balls and turns marbles to glass dust. Dickson’s an affable mad scientist. We tell friends and family to watch the videos. We check back to see what else Dickson is blending. And we start thinking a Blendtec blender would look good in our kitchen and make the perfect gift. Berger offers one other key insight on why things catch on. Word-of-mouth isn’t won by wooing a handful of connected influentials. Social epidemics are driven by your products and ideas. So whether you’re going into business, looking to bring in more business or pitching a big idea to make the world a better place, Berger has a proven gameplan to ignite a fire and get a growing army of Joes and Janes talking about you. This review first ran in the April 8 edition of The Hamilton Spectator. You’ve come up with a pretty cool and innovative solution to a money-wasting problem at work. You fly the idea past your boss. Your boss likes the idea and, with nothing on the agenda at the next weekly team meeting, pencils you in for an hour of air time. You pitch your idea to the team. A third of your colleagues appear to be vital signs absent. A third are preoccupied with their smartphones. And the remaining third, peeved that the meeting wasn’t scrubbed, tee off on you and your idea like a piñata. Your boss mercifully brings the drubbing to a close and asks the team to email you their feedback. Nothing lands in your inbox. Time passes and you tell your boss that you’re ready, willing and able to test drive the idea on your own. Your boss, confusing you with an eight-year-old, reminds you that there is no “I” in team. Around here, we always do better by working together. So you get 30 seconds at the end of another team meeting to ask if anyone’s interested in joining a planning, implementation and evaluation committee. Now everyone’s VSA. Your boss takes the lack of feedback and the no-show of hands as a sure sign that now’s not the best time to roll out your idea. You’re told that maybe your idea could be revisited in a few months when everyone’s not so busy and the whole team can get engaged in a more fulsome discussion. Welcome to the dark side of collaboration. Breeden says working solo should be our default position, collaborating only when it’s helpful and not because it’s an unquestioned sacred cow. The payoff from collaboration must be greater than the pain of getting and keeping everyone on the same page. Not only does our “getting things done” muscle go to seed, personal accountability also fades fast when it’s always all hands on deck. 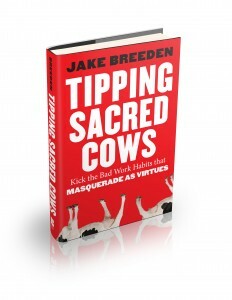 Breeden advocates ruthlessly eliminating automatic collaboration, making teams temporary, letting underperformers sink or swim, owning your results and getting work done by hunkering down on your own and unplugging from emails, voice mail and other distractions. The trick is to take a hard look at previously unquestioned virtues and your personal beliefs, keep the good and sidestep the unintended bad effects.